When the temperature and humidity reach the typical highs of Atlanta’s summer months, you should pay close attention to any signs that signal your child is experiencing heat exhaustion or dehydration. 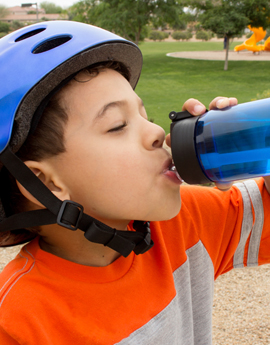 Make sure your child is well-hydrated before beginning any outdoor activities and has the opportunity to take frequent water breaks during play or exercise. Stay hydrated to play safely. Also, according to the American Academy of Pediatrics, any child who is dizzy, lightheaded or nauseous during play or during a strenuous sports practice, should be moved to a cooler environment.